Ground Transportation Options To And From The Airport. 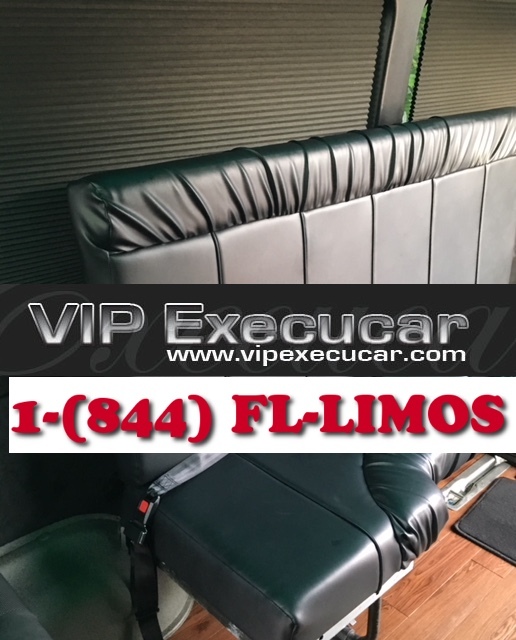 VIP ExecuCAR Service provides a clean, safe and relaxing Car Service ride in the Broward, Florida.Before you arrived Fort Lauderdale, visit VIP ExecuCAR for the latest info and advice, how to Reserve an airport shuttle or black car to and from MIA or around town!. Broward County Transit provide free shuttle buses from the FLL terminals to the Fort Lauderdale - Hollywood International Airport Station at Dania Beach.The station is just a few miles from the airport and a short ride on the shuttle bus.Our service is more convenient than reserving a TAXI Cab, or public transit or driving and parking at the airport, with prices that are generally more affordable VIP ExecuCAR Limo & Car Service, our Airport Chauffeurs and travel directors will go inside the terminal and meet all domestic travelers in the baggage claim area or their assigned airline arrival terminal at Hollywood-Fort Lauderdale International Airport. International flights are met either curbside or immediately outside of the customs area. 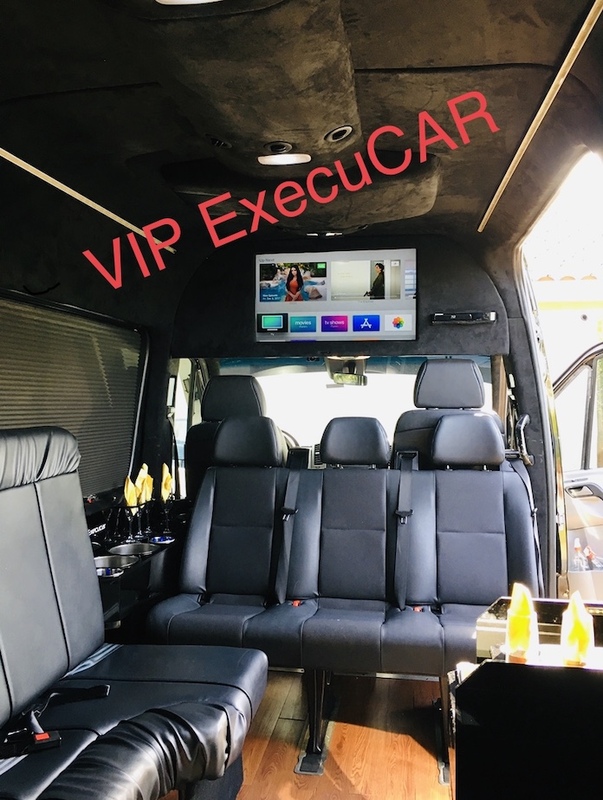 This is one of the newest addition to our Airport Shuttle Limo service, our 2015 Limo Sprinter Van is equipped with one large 32" flat screen TV,CD, & DVD player with I-Pod integration, state of the art lighting system, powelful audio system with surround speakers. Our Mercedes-Benz Sprinter Limousine, Limo Bus provides Mobile satellite television, Hight capacity air conditioning, exceptional Mercedes Benz smoot ride, large capacity regrigerator, 32" TV, and high end sound system,couch Style,lush leather, seating for up to 15 passengers, and is perfect for bachelor or bachelorette parties, airport transfers, nights out, corporate groups,special events, music/concerts, large groups goint out to town to sport game Heat of Miami. As this luxury vehicle is equipped with luxury accesories, audio system, USB Outlets,CD, Blue Rey_DVD, it is often used as an alternative to the big Party Bus Limo, because of its high roof, it allows guest to easily stand,walk and even dance inside!! 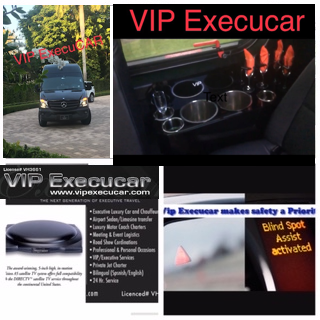 VIP EXECUCAR South Florida Airport Shuttle service can accommodate from 10 to 15 passengers with luggages from any Hotel, Airport, private Home, local tour,cruise line, to any destination, You may use it for transfers to the Carnival Cruise Lines in Port Everglades, Carnival Cruise Port Of Miami, Tampa Cruise Ship Shuttle, Cruise Port Transportation,Cruise Shuttle to Port Canaveral and Orlando International Airport shuttle service to cruises Hotels and travel in style to start your vacation, call 1-844-FL-LIMOS AIRPORT arrival reservations today. This vehicle is Mercedes Benz luxury sedan, the interior is luxurious it has a feel of a moderm comfortable Living room on whelles!! Miami Airport BLACK CAR | Fort Lauderdale Airport Limo | West Palm Beach Airport Limo | Airport Shuttle Van Service | Fleet: 12 passenger Mercedes Benz Limo Coach, 57 passenger Party Limo Bus, Mercedes Benz S550 limo | The 2015 Mercedes Sprinter Van Limo in Orlando | Van Limos Tampa- Stretch Limos Pembroke Pines and more.What is the cheapest way to get a passenger van limo to the hotel from the airport? Airport Car service is based on Boca Raton, Florida, services all major airports Fort Lauderdale, Miami, Naples Municipal Airport Limo Transportation and West Palm Beach luxury Airport Service. We provide Limousine Transportation and Rental in Fort Lauderdale, Sunrise Van Transportation Service, West Palm Beach Airport to Miami Airport Charter Limo Service, Bus transportation Miami,Miami Tours Limo Limousine, Aventura (Miami) Group Hotel Transportation, Corporate Shuttle Service in Coral Gables FL, 12 & 15 Passenger Van Limo Service in Fort Lauderdale, from 10 to 15 Passenger Van Rental in Miami,Miami & Ft Lauderdale Airport Sprinter Van,TAMPA Limousine,Aventura Van Limo service is a full Luxury van service serving Aventura Mall, Penninsula, Williams Island,Beach Club, and Turnbery Isle Marina, Book a Limo at Fairmont Turnberry Isle Resort in Aventura, Fl, You can go to Costa d'Este Beach Resort & Spa with a variety of transportations options, West Palm Beach Airport Weddings Limo, Weston West Palm Beach Airport Shuttle Miami Airport West Palm Beach Airport Taxi Serice Miami Beach Prom Limo Transportation Miami Beach, Brickell Limo transfer to Sony Open,South Florida Airport Shuttle Service,Limousine Transportation and Rental Service in Naples, Willians Island, Fl provided personalized Limo car service coming or going to any Luxury Hotel in Turnberry, Aventura Van Limo service,Sunny Island or Local Aventura shopping,West Palm Beach Airport Express Transportation Miami MIA West Palm Beach Airport Airport to Miami Beach Transportation Miami Beach MIA West Palm Beach Airport Shuttle Service Miami Beach Airport MIA to Miami West Palm Beach Airport Downtown Limo Limousine Service Miami Airport MIA Taxi Miami Florida FL Airport Taxi Miami Beach Transportation Shuttle Limo Limousine Bus Mini Coach to Miami Transportation , Fort Lauderdale Weddings Limo, We offer door pick up/drop off service in Fort Lauderdale International Airport and Port Everglades Cruise terminal is also included, West Palm Beach Airport Transportation Ft Lauderdale Weddings Limo Transportation, West Palm Beach Weddings Limo Transportation, Boca Raton Transportation, Jupiter Transportation, Orlando Disney World Transportation Service, Key West Tours Transportation Shuttle West Palm Beach Airport Limo. Miami Fl Florida to Miami Restaurants, West Palm Beach Airport Limousine, MIA Airport West Palm Beach Airport Miami to Miami Beach Clubs West Palm Beach Airport Car Service, Miami Hotels West Palm Beach Airport Transportation, Miami Beach Restaurants West Palm Beach Airport Car Service and Miami Beach Shopping Luxury Sprinter transportation door to door, West Palm Beach Airport Limo, West Palm Beach Airport Taxi Service West Palm Beach Airport Limousine. Miami West Palm Beach Airport Limo Bus | West Palm Beach Airport Miami Party Bus Transportation Service | Vip Execucar Miami Airport shuttle and Sprinter Luxury Van have full door to door pick ups, Port of Miami transfers, West Palm Beach Airport Wedding Limousine | Miami West Palm Beach Airport Wedding Miami Limo Bus | Miami Party Bus West Palm Beach Airport Transportation Service Miami Wedding Shuttle | Miami Wedding West Palm Beach Airport Transportation Miami Wedding Luxury Limousine Service, Mercedes Benz Sprinter Limousine Van 6-10 Passengers is now available from Miam Beach, West Palm Beach Airport Car Service Miami Rent a Car Solution, Miami Limo Hotel West Palm Beach Airport Taxi Service West Palm Beach Airport Limousine Service PBI Shuttle Service West Palm Beach Airport Transportation, luxury limo tours from Port Saint Lucie,Miami Club Limousine, Limo Proms, Affordable private door to door transportation to Key West, Limo Sweet Sixteen's Limo Anniversary Limo Birthdays Limo New Baby Pick-up Limo Bar Hoping ans special celebrations. The 10-15 Passenger Sprinter Party Limo Van offers the ultimate in style and luxury. Whether it's for traveling and or comfort, you will always be driving in style. Vip ExecuCAR Sprinter Van rental lets you rent the 2015 Mercedes-Benz Sprinter Passenger Vans for your driving needs in Kissimmee, Orlando, Tampa, Cape Canaveral, New Smyrna and Sunrise Fl. Meeting an important business client at the Airport? Arrive with class and show at the airport. A chauffeured Mercedes Benz E 350 will drive you anywhere at anytime in South Florida 24/7.Learn more about the 2015 Mercedes-Benz Sprinter 2500 Passenger witht Collision Prevention Assist, Blind Spot Assist and more.